It is time for our next Retro Reaction.. and as it’s part 2 of Our 3 Part Batman 66 Special let’s try this William Dozier style. What’s this… An animated movie tribute to the TV series reviewed right here on Reaction? A Return to Comic’s with Batman 66. Hold it there dear reader…. The Best is yet to come!!! Ok.. that was corny right? But you have to admit it’s in the style of the original series. I read the first issues of Batman 66 Comic to find that i didn’t feel they were fully in the spirit of the series. There was a helicopter explosion! The series couldn’t have done that. I discussed my concern with I3T who said to think of this as a big budget version. I tried then I decided to perhaps come back to the comics later. I’m glad I did. 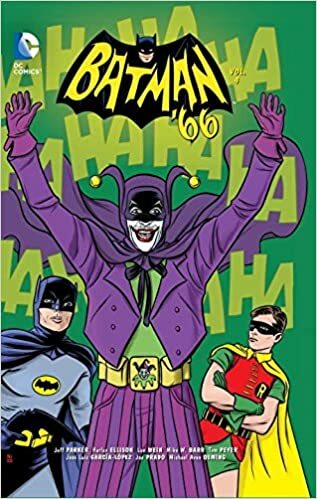 By the later volumes (The one I have is pictured above) the Batman 66 comic had nailed the tone of the series in a similar way to the new animated feature. I found the dialog coming to life in my head and sounding just like it did in the series. And that’s what was missing from those first few stories. The Dialog which later became purrrrr-fect. Yep every Egg Head Eggcellent and Joker Boy Blunder jibe they’re back. The sample that I read also managed to do some other clever things. They introduced Harley to the 60s Batman world. Then Arkham Asylum. Great to see lighter takes on these. I began thinking if there had been a fourth season .. I wonder if it would have looked something like this. (Of course it wouldn’t because these additional concepts were way after the show ended). Still clever integration. In summary some stories are very much in tone with the series. Some try but miss. As ever with longer running comic’s it can be a mixed bag (even in a single volume). Retro Modern Score 3.5/5 – And i’m being a little harsh. This is based solely on what the series tone was for me. If you’re able to forgive it a few “Lad’s rather than Chum’s” in the dialog and a few big battle scenes that just wouldn’t have happened in the 60s Buy a volume.